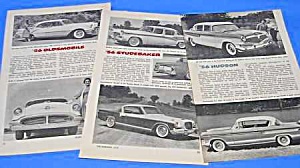 A great vintage (4) page original magazine article entitled: Buick, Chevrolet(nomad+), Hudson, Nash, Oldsmobile & Studebaker are discussed with images...Each page of the article measures approximately: 6 1/4" x 9 1/2" Condition: VG. An UNUSUAL addition to your 1956 Automobilia collection. Certificate of Authenticity is provided to show that this piece is from an original magazine (not a copy).